Were in March now and the weather is as horrible as ever, in the UK we have had snow, ice and rain even though its supposed to be spring and for this our skin is suffering! I think sometimes we do forget that our body needs just as much TLC as the skin on our faces so I've put together these few products that I use to hydrate my skin. When I have a bath or a shower I reach for this shower cream a lot, it contains Shea butter which is perfect for re hydrating the skin and keeping it smooth (plus it smells amazing). It is a soap free shower cream which means that it stops it from drying out the skin. It also leaves your skin feeling really soft once your dry because it soaks into the skin while your using it. Ahh the first thing I have to say is that it smells so good that I would gladly eat it! This sugar scrub is so good at removing dead skin cells because of its sand like consistency. If you work the product it by using circular motions and then wash it off your skin will feel amazing afterwards. I dont use this product everyday but I use it once or twice a week to keep my skin feeling smooth and soft. This rich cream is perfect for all over body moisturising, it has a thick consistency which spreads over the body leaving it nourished. I use this after a bath or shower to finish off my body care routine. It does have a strong scent but that doesn't linger for too long. It soaks into the skin fast and doesn't leave you feeling too greasy. I have to have a hand cream in my bag all the time and recently I have chosen to use this hand cream because it leaves my skin feeling really smooth. The scent of this hand cream is so fresh and light. This hand cream also soaks into the skin quickly so that your hands and left feeling oily. If your have really cracked and dry hands this product would be good for your skin because of its super hydrating properties. 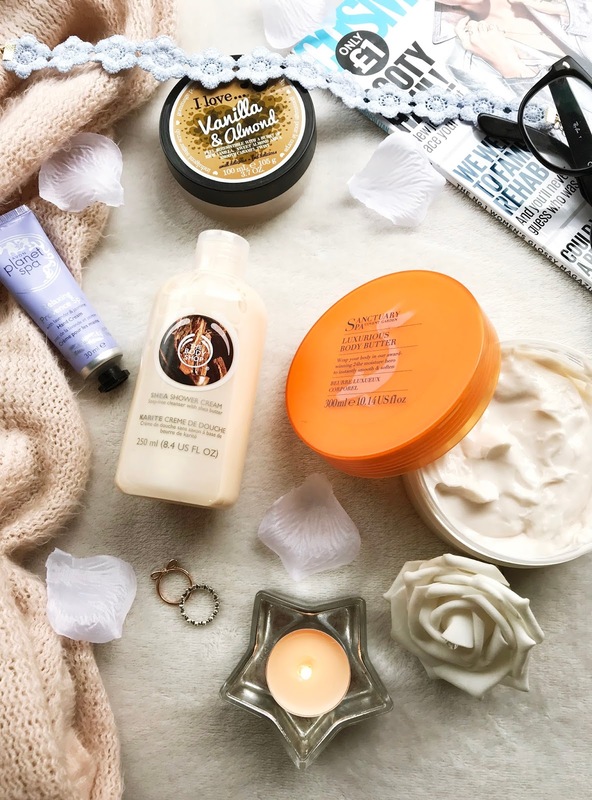 In the winter we need to take extra care of our skin so that it doesn't get really dry and sallow and these products help to keep my skin feeling soft and smooth. What are your favourite body care products for dry skin?